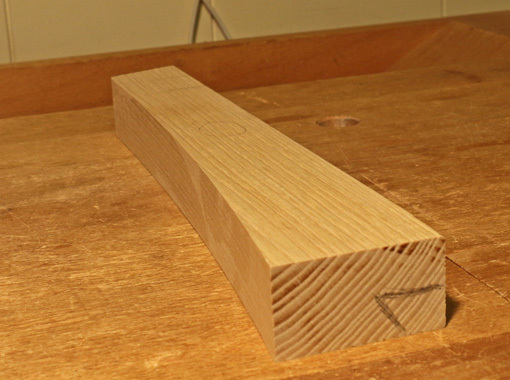 As I said, I’ll use whatever tool it takes to get the desired result for a particular curve in a particular wood. So let’s take a look at the available players and which make the cut (pun intended). Most of the game is won or lost on concave (inside) curves; the outside curves are easy. Spokeshaves perform well on relatively narrow work with cooperative grain, but they can disappoint on highly figured woods, even using a skewed attack. 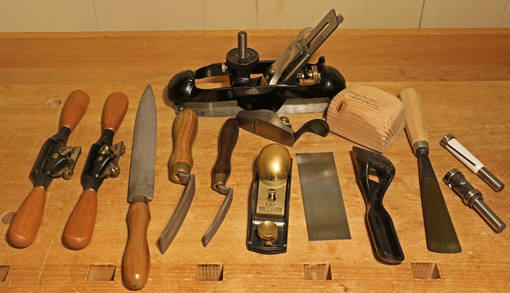 The round shave sees almost all of the action, while the flat shave spends most of the time on the bench because I generally don’t find it has much advantage over a block plane or other flat tools on gradual outside (convex) curves. It’s all in the wrists. The convex side of a half-round rasp is a good workhorse but has some weaknesses. If it is held at an acute skew, such as for steep inside curves, the teeth start to function ineffectively as tiny knives slitting along the grain, but if the tool is pushed more across the work, tearout results at the far side. Also, the tool is really working the curve at different points, and thus possibly different radii, at once. So, for more control on gradual curves, I call up the Auriou curved ironing rasps (fourth and fifth from the left in the photo). They have an excellent reliable feel on the curve but lack speed, so they are not for hogging off a lot of wood. The compass plane, which is a shaping plane in my view, was covered in two earlier posts, but a different twist on curved soled planes deserves mention. As discussed in the previous post, the sole must be set to accommodate the steepest portion of a chosen length of inside curve, so a given setting is approximate at best. 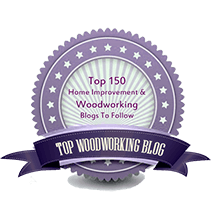 Thus, a reasonable alternative to an adjustable compass plane is a set of a two or three wooden fixed curve sole planes, vintage or shop-made. Hunting on vintage tool sites will turn up a few wooden curved sole planes with an adjustable toe piece to accommodate different inside curves. I have not tried one but I wonder if any readers have. The little Lie-Nielsen spoon bottom plane is a different type of player but performs well despite its lack of size. A card scraper is a good player if used in the proper role – great for smoothing curves but poor for shaping them because it simply rides whatever curve it encounters. Underestimated but well within anyone’s salary cap is the curved sanding block. Customized in length, width, and curve, they can smooth curves but also can be designed as pretty fair shaping tools using coarse grit paper. 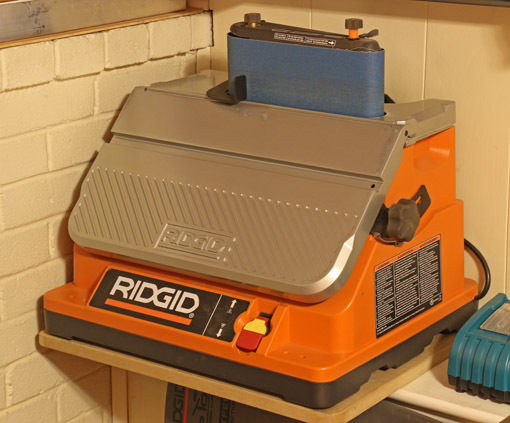 Speaking of sanding, the Ridgid oscillating spindle sander is very handy because it can be set up as a sideways belt sander or as a simple spindle sander in a range of sleeve sizes. Back to the opening photo, the humble Stanley Surform shaver, a product of a program whose glory days are past, is an effective rough hogger. Surprisingly, it can be tuned to perform with a bit more finesse, as will be discussed in a future post. The Allongee style gouge, #5 sweep, 38 mm, is a good reserve player for cross grain hogging in wide curved work, much like a freehand scrub plane for curves. A couple of other tools are not in the TFC Team photo because, though they arrived with promise, were cut after tryouts. I found the flexible curved float file to be slow and awkward, and did not live up to the reputation of its flat cousins. The same was so for the Microplane flexible insert for a hacksaw frame. These are just this coach’s calls; you might like them. When there is a simple curve in one plane, as shown below, to be made in multiples, I go to the pattern routing game plan, as represented by the pattern/flush cut bits on the right in the top photo. Of course, just about all curves start with good, accurate sawing, which usually means a well-tuned bandsaw. That’s the fan base behind the whole team. Next: nuancing the Surform Shaver. Love my rigid spindle sander/belt sander. Its cheap and it works for what I need. It can be stopped and it can slow down if you push it hard but for 100 bucks I can’t complain. Saves my money for some Lie Nielsen. Thanks for reading. I find the Ridgid has plenty of power but I guess we’re using it differently. It’s listed at about $200 now on the Home Depot site but maybe there are bargains around. I wish they made the fold-up table more rigid and true, especially since the platten and the oscillation are pretty good.